El desprendimiento de los glaciares suele ir acompañado de un fuerte crujido o un sonido atronador​ antes de que bloques de hielo de hasta 60 m de altura se suelten y se estrellen en el agua. La entrada del hielo en el agua causa olas grandes y, a menudo, peligrosas.​ Las olas formadas en lugares como el glaciar de Johns Hopkins pueden ser tan grandes que los barcos no pueden acercarse a menos de 3 km . Estos eventos se han convertido en importantes atracciones turísticas en lugares como Alaska. Calving of ice shelves is usually preceded by a rift.​ These events are not often observed. 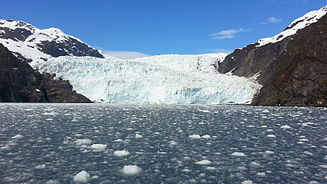 A calving glacier and the resulting ice field. It is useful to classify causes of calving into first, second, and third order processes.​ First order processes are responsible for the overall rate of calving at the glacier scale. The first order cause of calving is longitudinal stretching, which controls the formation of crevasses. When crevasses penetrate the full thickness of the ice, calving will occur.​ Longitudinal stretching is controlled by friction at the base and edges of the glacier, glacier geometry and water pressure at the bed. These factors, therefore, exert the primary control on calving rate. Second and third order calving processes can be considered to be superimposed on the first order process above, and control the occurrence of individual calving events, rather than the overall rate. Melting at the waterline is an important second order calving process as it undercuts the subaerial ice, leading to collapse. Other second order processes include tidal and seismic events, buoyant forces and melt water wedging. Though many factors that contribute to calving have been identified, a reliable predictive mathematical formula is still under development. Data is currently being assembled from ice shelves in Antarctica and Greenland to help establish a 'calving law'. Variables used in models include properties of the ice such as thickness, density, temperature, c-axis fabric, impurity loading, though 'ice front normal spreading stress', is likely the most important variable, however it is usually not measured. There are currently several concepts upon which to base a predictive law. One theory states that the calving rate is primarily a function of the ratio of tensile stress to vertical compressive stress, i.e., the calving rate is a function of the ratio of the largest to smallest principle stress.​ Another theory, based on preliminary research, shows that the calving rate increases as a power of the spreading rate near the calving front. En octubre de 1988, the A-38 iceberg broke away from the Filchner-Ronne Ice Shelf. It was about 150 km x 50 km . 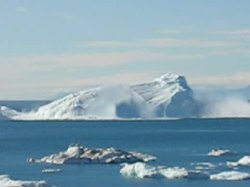 Un segundo desprendimiento ocurrió en mayo de 2000; y, creó un iceberg de 167 km x 32 km. This large ice shelf, located in the Weddell Sea, extending along the east coast of Antarctic Peninsula, consists of three segments, two of which have calved. En enero de 1995, the Larsen A Ice Shelf containing 3.250 km² of ice 220 m thick calved and disintegrated. Then the Larsen B Ice Shelf calved and disintegrated en de febrero de 2002. Also known as the Ilulissat Glacier or Sermeq Kujalleq in western Greenland, in an ongoing event, 35 billion tonnes of icebergs calve off and pass out of the fjord every year. 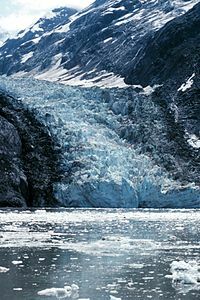 Photographer James Balog and his team were examining this glacier in 2008 when their cameras caught a piece of glacier the size of the Lower Manhattan fall into the ocean.​ The calving event lasted for 75 minutes, during which time the glacier retreated a full mile across a calving face three miles (five kilometers) wide. Adam LeWinter and Jeff Orlowski captured this footage, which is featured in the film Chasing Ice. ↑ Glossary of Glacier Terms, Ellin Beltz, 2006. Visto julio de 2009. ↑ Glacier Bay, National Park Service. Visto en julio de 2009. ↑ Glacier Calving photos. Visto en julio de 2009. ↑ ARCTIC, v. 39, No. 1 (marzo de 1986) P. 15-19, Ice Island Calvings and Ice Shelf Changes, Milne Ice Shelf and Ayles Ice Shelf, Ellesmere Island, N.W.T., Martin O. Jeffries, 1985, University of Calgary. Retrieved 18 July 2009. ↑ Oceans, Oxfam. Retrieved June 2009. ↑ Promotions/Public Relations (8 de diciembre de 2006). «The loose tooth: rifting and calving of the Amery Ice Shelf - Australian Antarctic Division». Aad.gov.au. Archivado desde el original el 2 de octubre de 2009. Consultado el 30 de julio de 2010. ↑ «Calving | Define Calving at Dictionary.com». Dictionary.reference.com. Consultado el 30 de julio de 2010. ↑ Benn, D.; Warren, C.; Mottram, R. (2007). «Calving processes and the dynamics of calving glaciers» (PDF). Earth-Science Reviews 82: 143-179. Bibcode:2007ESRv...82..143B. doi:10.1016/j.earscirev.2007.02.002. ↑ Nick, F.; Van der Veen, C.; Vieli, A.; Benn, D. (2010). «A physically based calving model applied to marine outlet glaciers and implications for the glacier dynamics» (PDF). Journal of Glaciology 56: 781. doi:10.3189/002214310794457344. ↑ Kohler, Jack (28 de septiembre de 2010). «How close should boats come to the fronts of Svalbard’s calving glaciers?». Norwegian Polar Institute. Archivado desde el original el 28 de septiembre de 2010. Consultado el 18 de enero de 2018. ↑ Modeling Iceberg Calving From Ice Shelves Using a Stress Based Calving Law: The. Adsabs.harvard.edu. Bibcode:2008AGUFM.C41D..03B. ↑ Business Support Group (18 de mayo de 2009). «Rifting and calving of the Amery Ice Shelf - Australian Antarctic Division». Aad.gov.au. Archivado desde el original el 30 de septiembre de 2009. Consultado el 30 de julio de 2010. ↑ ARCTIC, v. 39, No. 1 (marzo de 1986) p. 15-19, Ice Island Calvings and Ice Shelf Changes, Milne Ice Shelf and Ayles Ice Shelf, Ellesmere Island, N.W.T. ↑ «Video: Largest glacier calving ever caught on film | EarthSky.org». earthsky.org (en inglés estadounidense). Consultado el 20 de febrero de 2017. ↑ McNamara, Garrett. «Garrett McNamara Extreme Waterman». ↑ «Glacier Surfing». 30 de junio de 2008. Archivado desde el original el 1 de febrero de 2009. Holdsworth, G. 1971. Calving From Ward Hunt Ice Shelf, 1961-1962., Canadian Journal of Earth Sciences 8:299-305. Jeffries, M. 1982. Ward Hunt Ice Shelf, primavera de 1982. Arctic 35542-544. Smith, G. 1952. Arctic Ice Islands. Arctic 5:67-103. Lyons, J.B., Ragle, R.H. 1962. Thermal History And Growth Of The Ward Hunt Ice Shelf. International Union Of Geodesy And Geophysics International Association Of Hydrological Sciences, Colloque D’obergurgl, 10–18 de septiembre de 1962. 88-97. Rectic And Maykut, G.A., Untersteiner, N. 1971. Some Results From A Time Of Geophysical Research Dependent Thermodynamic Model Of Sea Ice. Journal 761550-1575. Wikimedia Commons alberga una categoría multimedia sobre Desprendimiento de hielo. Esta obra contiene una traducción derivada de Ice calving de Wikipedia en inglés, concretamente de esta versión, publicada por sus editores bajo la Licencia de documentación libre de GNU y la Licencia Creative Commons Atribución-CompartirIgual 3.0 Unported. Artículo en Universidad de Chicago. Esta página se editó por última vez el 14 abr 2019 a las 07:13.